I I I I… Hate a parade. I’m not a fan of pomp and circumstance. I only went to my college graduation because my parents insisted. I never cared for weddings- as a guest or at my own: too much fuss. The worst form of pomp and circumstance for me however, is a parade. No Bowl parades, no Thanksgiving Day parades, and please, no New Year’s Day parades. Drunken people, noise, crowds? No thanks. You love a parade? Good. Enjoy. Leave me at home. One of my earliest memories is when I was four years old. 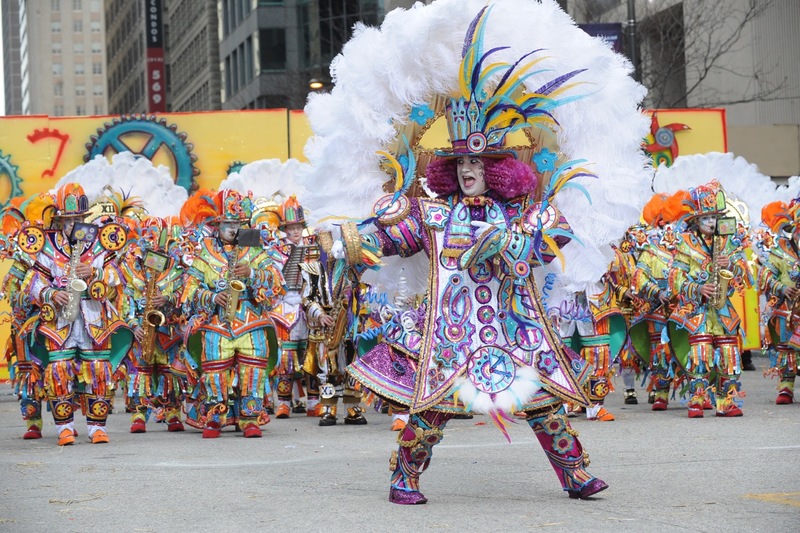 The New Year’s Day parade in Philly is a 114 year old tradition and a really big deal: brightly plumed and sequined musicians (aka the Mummers) playing their instruments while walking or strutting (in carefully choreographed routines) down Broad Street while thousands stand on the sidewalks to watch. The street is flooded with music and colors, glitter and ginormous headpieces. It’s quite the spectacle. And one would think that a young child would enjoy this sight. But not me. Nope. Gussie carried me on his shoulders that New Years Day so I could see the Mummers. I imagine I was non-plussed because shortly after it started I asked to go home. On his shoulders. But my father didn’t take me home. He took me to my Aunt Liz’s house nearby. My recollection of that part is fuzzy but it was a good feeling. I remember a bunch of my great aunts and uncles and cousins there, and loads of food. It’s pretty impressive that my four year old self hung on to that. Many families in Philly had an open house on New Year’s Day and kept food out for drop-ins. My family was no exception. 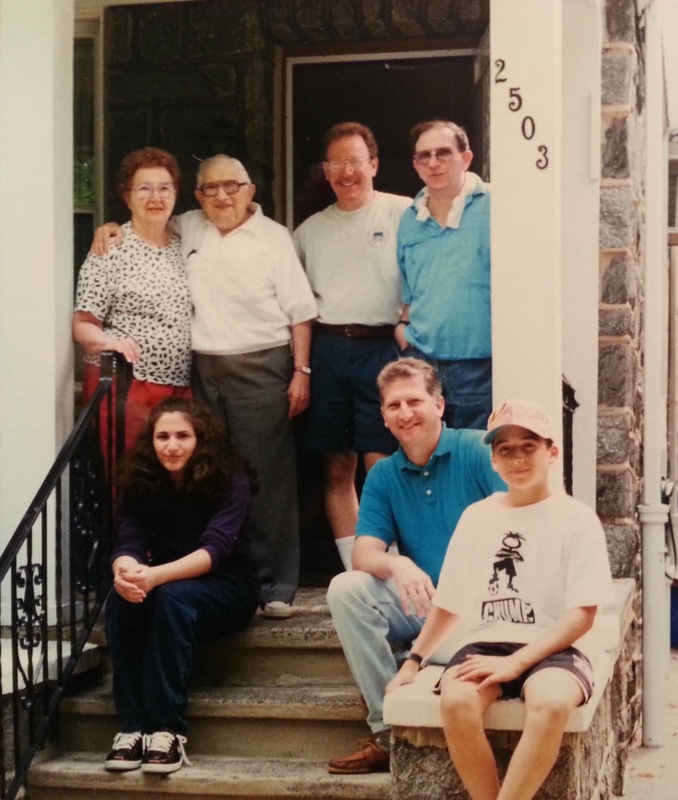 My grandfather’s sister, my great aunt Liz Giunta, loved to cook and have family over to her and my great uncle Nick’s house on Cleveland Street in South Philly. She did it well, too. She used to put out a huge spread and that meant tripe. My father loved tripe and as my cousin Joe recalls, particularly Aunt Liz’s. Not being a fan of tripe myself (actually, the thought of it makes me shudder), I can only imagine how good he thought it was because even if my father went to the parade by himself, he was sure to stop at Aunt Liz’s for that tripe sandwich. I went to the parade a few more times between age 4 and around 22 and I really only wanted to go if we could stop at Aunt Liz’s. We stayed warm in Stolfo’s funeral home basement (another place my father was invited to eat) then stopped at Aunt Liz’s. It was the only house we had to go to because everyone was there. As a teen I specifically asked my father if that was on the itinerary. I loved seeing all those Italians (my grandfather was one of twelve) crammed around the table and in the living room, eating and talking. My mother’s side of the family was small and not very close so this was a nice experience for me. It’s something my children won’t get to experience, both because that whole generation is gone now, and because most of the Fanelli family is spread out all over the PA and NJ maps. It makes me feel melancholy because we can’t get that back. Families are much smaller than twelve these days, and the family dynamic is not what is was 30 years ago. My father never understood my aversion to parades but acknowledged that the first time he took me (age 4) he knew I didn’t like it. But more important than the parade was the family that was woven into that day. He had countless stories about growing up surrounded by aunts and uncles and cousins. It’s something I wish my children and I could experience now, even if it means enduring a parade. I would do it. I would go to the parade. Just for a little while.